Artek: "A country just for kids". 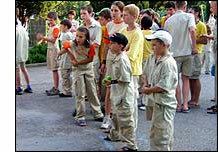 A Soviet-era youth camp is 80 years (2005). The Artek camp for Young Pioneers - a mass organisation for Soviet children aged 10-15 - was built on the Crimean peninsula a few years after the formation of the USSR itself.